One would think that nostalgia would be something that I would have a lot of in my photo portfolio, given that there are so many historical places in Iowa, but it is probably my least populated category. Not really sure why. So it stands to reason that when I first saw this place on The Forgotten Iowa Historical Society Facebook group by the owner of the station that I had to go see it. I thought it was really cool, and I had a planned Des Moines trip coming up, so Missy and I made a special trip to go see it. Back to Facebook: After I visited I pulled up the post from last month and noted that I had visited. The owner of the station responded and we had a nice chat. Turns out he has a Facebook page of his own specifically for the station… the Perry Sinclair Station page. He bought it not too long ago and has been restoring it continuously. It’s really quite remarkable, and worth a trip by itself. The part I find the most interesting is the inside store portion with all sorts of vintage items from the past. Take a look at his page, you’ll enjoy it. Funny story: The station has a working rubber hose/bell system that was common back in the day. While I was shooting a couple young guys drove by in a pick-up and honked, the guy in the passenger seat leans out the window and yells, “Step on the hose. It rings a bell inside!” I literally LOL’d. 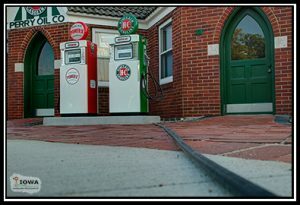 Not only am I old enough to remember those (my first job was at a full-service gas station in 1980 and we had those), but I had already stepped on it several times to ring the bell. I will process and post a few more photos from here as time goes by, and I will be making a return trip sometime. Stay tuned. Love this choice of photo. Nice blog too. Great way of adding stories. I think it was very interesting with the separate parts. I look forward to going back.